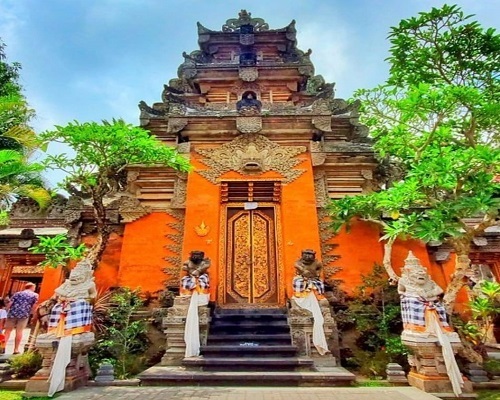 Bali Water Sports and Ubud Tour is a Bali Combination Tour Package to enjoy marine activity with many kind of water sports activity available around the beach and continue visiting the famous tourist destination of ubud Village with amazing culture and art. The Bali Water Sports and Ubud tour will start by visiting the beautiful beach for enjoy water sports package we provide such as Flying Fish, banana boat, glass bottom boat and turtle islands, after do water sports you will enjoy lunch with Indonesian food, and the lunch was included in the package, Then after finish having fun with the water sport packages we continue visiting Ubud Celuk village to see the remarkable and artistic gold and silver crafting, then visiting Ubud monkey forest is small monkey forest in Ubud village, continue the Bali Water Sports and Ubud tour to visit the Ubud Royal Palace is traditional residential house of Ubud King long time ago and then we visit the Ubud art market located right opposite the Ubud royal palace, see the unique social activity life in the Ubud market. Is good place for buy handicraft in this market, the price is negotiable, if you have good skill of bargaining you can get better price. The tour will be enjoyable with our Bali Tours driver will always make you smile during the journey. Below is explanation of tourist destination will be visit during Bali Water Sports Packages and Ubud Village Tour. First visit on Bali Water Sports and Ubud Tour is water sports provider for do Water Sports Activity package such as : Flying Fish, Banana Boat, Glass Bottom Boat and Turtle Islands Tour. Perhaps all of us love the adventure of water, here you can do water activities that have been provided and do not doubt they've experienced so all you get a warranty. Enjoy Bali Water Sports adventure for your enjoyment. Bali Water Activity giving the fantastic experience marine adventures for everyone who desires to enjoy the exciting wet adventure. Anyway, if you are looking for fun, you have come to the right place! If you are going to get wet, find your own level of Water Sports Activity. Ubud Royal Palace also popular with name Puri Saren and located right in the center of Ubud village, Ubud Royal palaces have long been the largest landholders in the area. Great site ti visit during Bali Water Sports and Ubud Tour. They used to manifest this role in a largely "custodial" way, managing vast tracts of rice-growing land for the benefit of the community and the temples. We can visit the ubud palace and see the beauty of design residential house of Ubud king long time ago. Puri Saren is equipped by a Wantilan/auditorium that is a large building of meeting room and a banyan tree as shelter place.